Using a flip-card format, this compact guide provides protocols that take the guesswork out of image documentation. 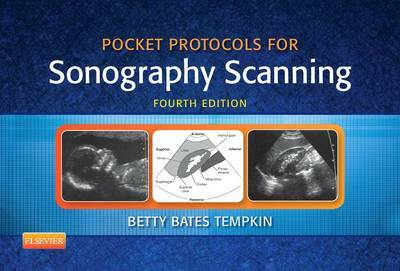 These comprehensive protocols follow the imaging guidelines of the American Institute of Ultrasound in Medicine (AIUM) and include a universal method for documenting any type of pathology. Examples of the required images for the physician's diagnostic interpretation are included. Documentation specifics are provided for full and limited abdominal studies, gynecological and obstetric exams, and prostate evaluations. Also provided are protocols for small parts, vascular system, and echocardiography. Protocols following guidelines provided by AIUM provide standardized scanning methods and image documentation. Step-by-step instructions for sonographic studies of various organs and body areas reinforce AIUM protocols while scanning. Over 700 images create a visual step-by-step scanning approach to the performance of scans and image documentation for physician diagnostic interpretation. NEW! Musculoskeletal protocols offer the images and information needed to properly scan musculoskeletal anatomy. NEW! 2-color streamlined design enhances readability. NEW! New images complete all the protocols approved by the AIUM. NEW! Smaller size makes the pocket guide easier to carry around. NEW! Part dividers with bleed allow for quick access to desired protocols.